Map of Turkey in Asia. A fine example of Thomas Cowperthwait and S. A. Mitchell's 1854 map of Turkey in Asia. 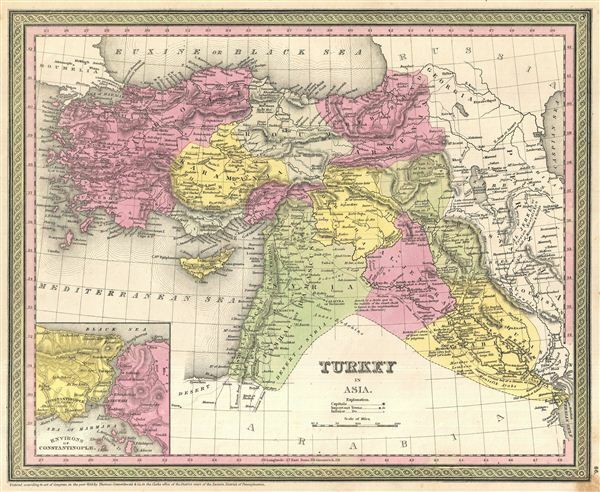 Centered on the Holy Land, this map covers the Asian territories claimed by the Turkish Ottoman Empire c. 1850. These include the modern day countries of Turkey, Cyprus, Syria, Jordan, Lebanon, and Iraq. An inset in the lower left quadrant details the environs of Constantinople and the Bosporus Straits. The important caravan route from to Rosrah, on the Persian Gulf, is noted. The whole is engraved in Mitchell's distinctive style with green border work and vivid pastels. Political and topographical features are noted and color coded with elevation rendered by hachure. Rumsey 0537.065 (1846 edition). Phillips (Atlases) 814.